BURLINGTON, Vt. - Kristina Shanahan's three-point night and Maude Poulin-Labelle's second-period goal lifted the Vermont Catamounts (4-9-4, 3-7-2 WHEA) over the Maine Black Bears (10-7-1, 4-7-1 WHEA) in the final home game of 2018 Saturday afternoon at Gutterson Fieldhouse. "This was a great team win for us and I am especially pleased to see so many different players contribute," said head coach Jim Plumer. "Kristina Shanahan had an outstanding game with three assists and freshman defender Ellice Murphy played the best game of her young career and picked up her first career point. We have been improving at a steady rate so far this season and we have a lot to look forward to." - The conference foes exchanged goals in the first period. Vermont opened the scoring with 4:05 left in the frame on Olivia Kilberg's second goal of the season. The Cats had established overwhelming pressure in the offensive zone after a power play expired. Shanahan and Murphy scored on the game's first goal. - The Black Bears answered a minute later when Alyson Matteau rushed up the ice and snapped a shot over the glove of Melissa Black (24 saves). Cailey Hutchison and Lydia Murray had the assists. - Vermont went on the offensive early in the second period to outshoot the Black Bears 9-0 in the first seven minutes. Saana Valkama netted her third goal of the season when she received a back pass from Shanahan and made a nifty move around Carly Jackson (22 saves) for the go-ahead marker. - Once again, Maine responded quickly. Anna Zikova wristed a shot from the high slot through traffic to knot the game up at 2-2. Hutchison and Murray assisted on the goal. - UVM retook the lead with 7:31 left in the middle frame with Poulin-Labelle's goal. The rookie defender received a pass from Valkama between the hashmarks and wired a wrist shot over Jackson's glove. Shanahan added her third assist of the game on the game-winner. - Black made 10 saves in the third period to hold off a Maine rally. The Catamounts penalty kill came up big in the final frame when they killed off a 5-on-3 advantage to stifle the Black Bears. 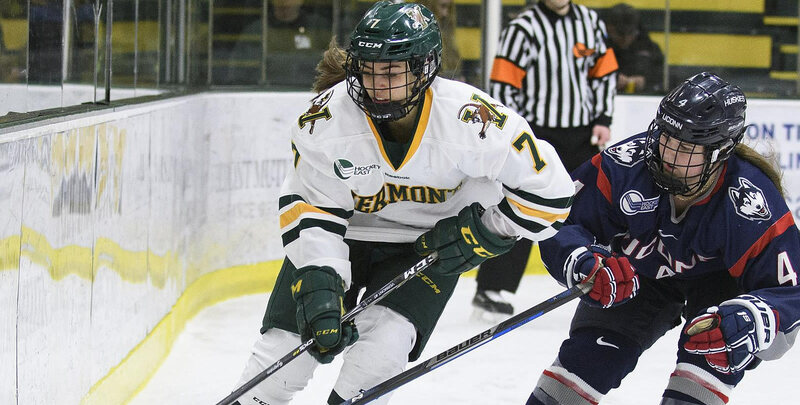 - Kristina Shanahan's three assists made her the first Catamount to accomplish that feat since Taylor Willard posted three helpers at Boston University Feb. 2, 2018. - With the victory, the Cats Win, Community Wins campaign and Vermont Mutual Insurance Group will donate another $100 to the Boys and Girls Club of Burlington, bringing this year's total to 109 wins and $10,900. Vermont heads to New Haven, Connecticut next weekend to face the Yale Bulldogs for the final two games of 2018. The series opens Friday (Dec. 7) at 6 p.m. and closes Saturday (Dec. 8) 3 p.m. at Ingalls Rink.